Two new shiny kissing gates have been installed at the start of the Dales Way. They replace some tired and battered but well loved metal kissing gates, and are thanks to the hard work of the countryside rangers from Bradford Council. There has also been considerable work to improve the paths and drainage along the way at the first section of this popular walk. It all makes the start of the walk even more attractive to first-time visitors to the area. This entry was posted in Uncategorized and tagged gates on May 17, 2014 by Tony Grogan. 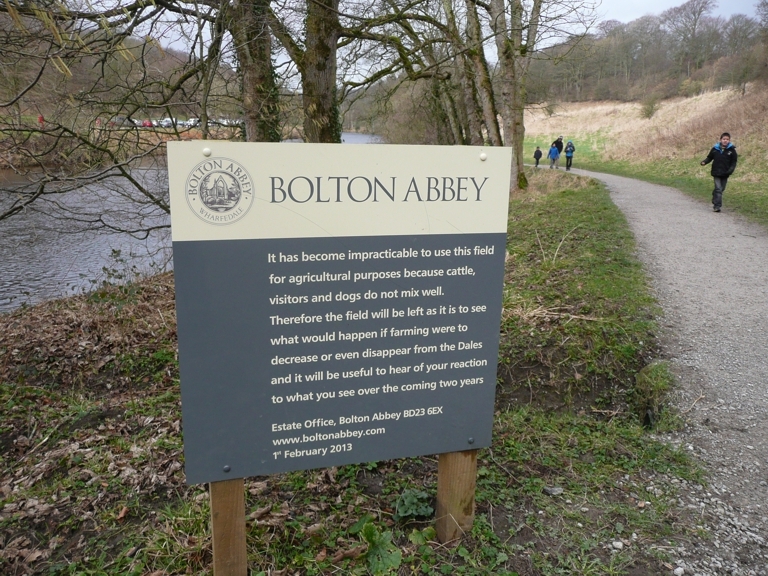 Footpaths through the Bolton Abbey Estate have been improved over the winter months, particularly the high level paths between the Priory and Pickles Beck. This section of the Dales Way is a permissive path. There has also been resurfacing work on the section between the Cavendish Pavilion and the Strid, with both high level and low level routes available. These too are permissive paths, courtesy of the Estate. This whole section makes for a delightful and easy walk, even in the midst of winter, and is an early highlight of the Dales Way. See the Bolton Abbey Estate website here. This entry was posted in Uncategorized on February 27, 2014 by Tony Grogan. Our DVD has recently been brought right up to date. It now has 517 images and lasts 44 minutes. It includes the proposed Watershed Alternative over Cam Fell and Great Knoutberry down to Lea Yeat. This DVD will enable you and your party get a glimpse of what lies ahead along the Dales Way footpath and add to your expectations for the trip. After your adventure another viewing will rekindle the memories. You can order the DVD from our website here. This entry was posted in Uncategorized and tagged Dales Way, DVD on February 11, 2014 by Tony Grogan. This year marks the 40th anniversary of the publication of Alfred Wainwright’s Coast to Coast Walk. His challenging 190-mile walk across Northern England has grown to be by far the most popular long distance trail in the country. What is not generally known is the influence that the Dales Way had on Wainwright’s original creation. Wainwright first had the idea for his Coast to Coast Walk after walking the Pennine Way, shortly after this first National Trail had been officially launched in 1965. Wainwright wrote his popular Pennine Way Companion (published in 1968), but admitted that he had not really enjoyed the trail. This set him to thinking of devising his own, “superior” walk. 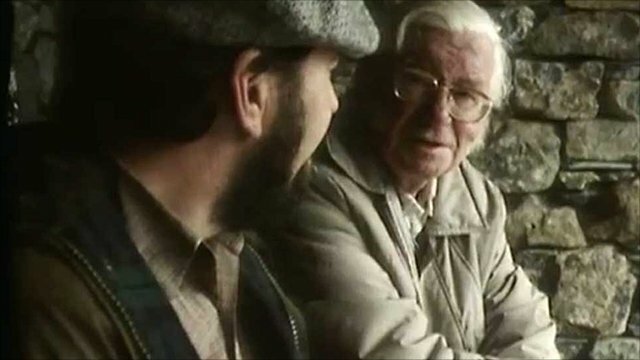 He came up with the idea of a walk across England, from coast to coast. He fixed the start and end points, St Bees Head and Robin Hood’s Bay, and drew a line with a ruler from one to the other. His bee-line route crossed three National Parks: the Lake District, the Yorkshire Dales and the North York Moors. Wainwright surveyed possible options for a high-level route into Yorkshire, shadowing the Dales Way, before ultimately rejecting them in favour of a more northerly route across the Westmorland Fells. The results of his research were included in his book Walks on the Howgill Fells, published in 1972. His Coast to Coast Walk was published in 1973. This entry was posted in Uncategorized on September 22, 2013 by Tony Grogan. 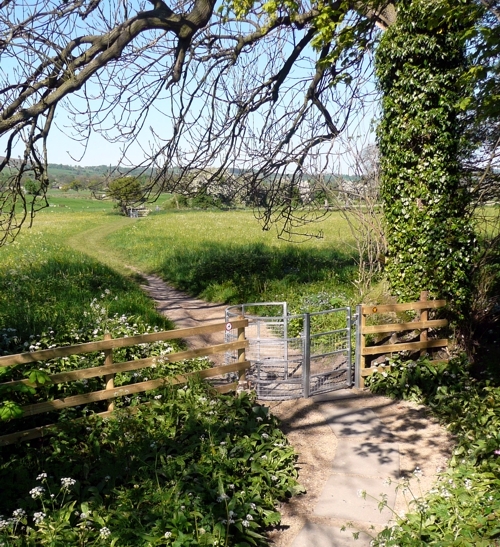 The Harrogate Ramblers are to lead a free public walk of the entire Harrogate Dales Way Link in August. All are welcome to join. 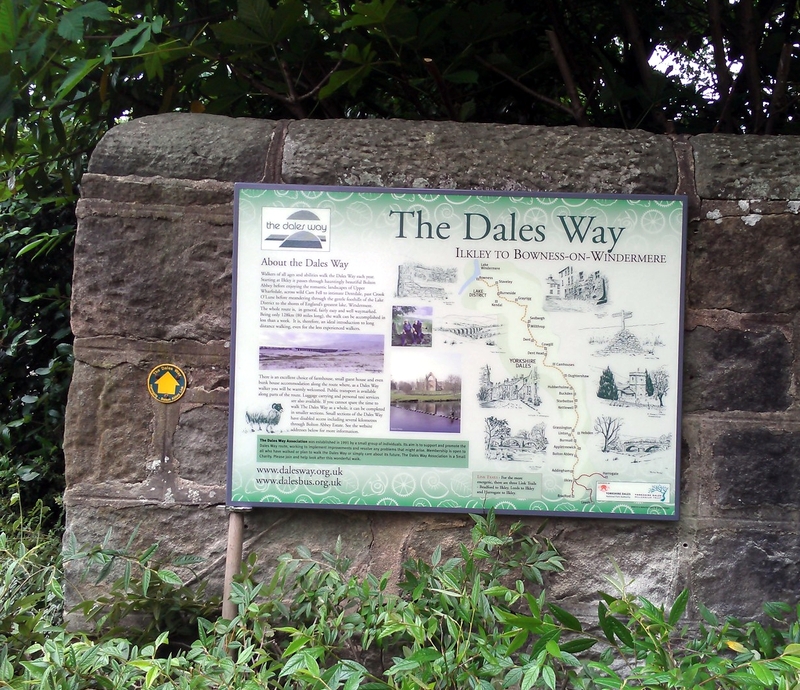 The walk will pass the newly erected Dales Way Information Board in Valley Gardens – the first of the new batch of replacement boards to go up. All the boards, which were first erected in 2005, will be replaced over the coming months. The original Harrogate Link finished at Bolton Abbey, but the route was revised a few years ago to finish at Ilkley, linking to the start of the Dales Way. The public walk of the 16½ mile route is on Saturday, 31st August, starting at 9.00 a.m. from the Sun Pavillion in the Valley Gardens, Harrogate. Return from ilkley will be by public bus. There is no charge and all are welcome. This entry was posted in Uncategorized and tagged Harrogate Link on July 5, 2013 by Tony Grogan.